10/20 UPDATE: Thanks to the efforts of you and other advocates and activists across the state, Gov. Wolf has protected Pennsylvanians’ access to Medicaid by vetoing HB 59! Despite Pennsylvania’s huge and still unresolved budget gap, Rep. Mike Turzai and other Republican leaders in the state House haven’t allowed a vote on creating a severance (or extraction) tax for gas drillers, a tax that every other state with gas drilling has. But what they and their Senate colleagues do seem to agree on is huge, damaging changes to Medicaid. In a nearly party line vote, both the House and Senate finished passing HB 59, a change to the Pa. Human Services (formerly “Welfare”) Code, earlier this month. The bill would cut health care access by increasing barriers to Medicaid eligibility and reducing the program’s coverage of essential benefits. The bill calls for putting in place Medicaid work requirements for all working-age, able-bodied, non-pregnant enrollees. That may seem like a totally reasonable thing to do. Here’s why it isn’t. Government assistance isn’t a way of life for able-bodied adults. Medicaid work requirements are trying to solve a problem that doesn’t exist. It is just an expensive way to reinforce an unjust stereotype. It serves to promote the myth that many people are choosing government support as a way of life. Government should therefore treat with suspicion everyone who asks for help and make them jump through many humiliating hoops to get assistance. 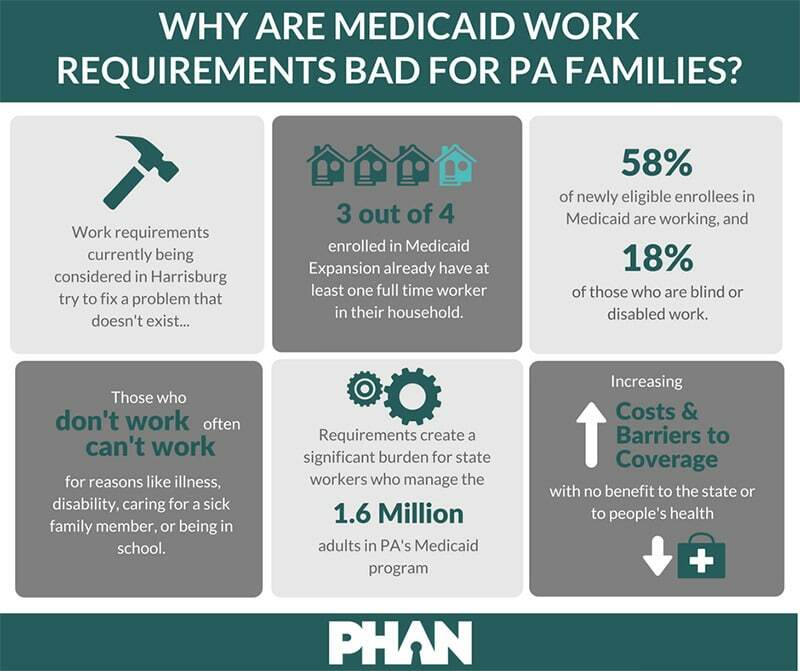 According to Pennsylvania Health Access Network, only 28% of Medicaid recipients live in households that do not have employment income. Nearly all of those who are not working are sick, disabled, receiving medical treatment, attending school, retired, or are providing critical care to young, sick, or elderly family members. Only 5% lack proof of one of these allowed exemptions. Studies show that in a three-year period only about 1/3 of people are enrolled in Medicaid the entire time, despite the program’s high rates of illness or disability. Medicaid work requirements will cause vulnerable populations to lose healthcare. People who are homeless, in treatment for a substance use disorder, or have chronic debilitating conditions that are not yet official “disabilities” will likely not be able to meet the new work requirements. They are at risk of losing their coverage. Medicaid work requirements will increase government costs while decreasing government efficiency. The work requirement wastes already limited government resources. Despite looming budget cuts, our County Assistance Offices will have to verify that 1.6 million adults are working. This will drown offices in red-tape, hurting all low-income people in need of help. HB 59 creates guidelines of who must comply with work requirements and what compliance means. Such guidelines already exist for two other programs that the Office of Income Maintenance administers: SNAP/food stamps and TANF. The bill therefore creates redundant and time-consuming red tape, requiring government employees to duplicate their work. Medicaid work requirements will increase healthcare costs. This bill would eliminate Medicaid coverage for key benefits, like dental, vision, podiatry, some mental health and substance use disorder services, help getting to appointments, and access to health centers. We could see even more extreme rollbacks if the federal administration weakens the definition of “essential health benefits”, eliminating things like physical therapy and even prescription drugs. The humiliating and time-consuming nature of the requirements makes it likely that people will forego medical coverage and treatment until they’re in a full-blown health crisis, which is much more expensive to treat. This creates huge costs for themselves, their employers, the healthcare system — costs that will also get passed on to everyone else in the form of higher prices. Less than half of Pennsylvania’s employers provide health care. That’s why one of the first things Gov. Wolf did upon taking office in 2015 was accept federal money to expand Medicaid to cover more low-income uninsured Pennsylvanians. More than 700,000 Pennsylvanians are no longer uninsured thanks to Medicaid expansion. Just Harvest and our allies Pennsylvania Health Access Network and Consumer Health Coalition (and 171 other organizations) were very happy that Gov. Wolf said he will veto HB 59 once it reaches his desk in order to continue protecting this critical program. But given the state’s difficult budget situation we can’t take anything for granted. Make sure Gov. Wolf keeps his promise! Send him a message. 30 Weeks of Action, Gov. Wolf, Medicaid, Medicaid expansion, Pennsylvania, state budget, state government, Take Action!